Public Relations is a very important industry for individuals and brands to generate positive exposure, while gaining attention through a successful marketing campaign. The value of remaining relevant and communicating with current trends will greatly benefit any pitch, story or client. 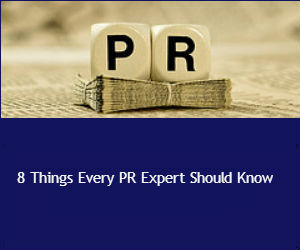 And to remain relevant and on top of your game we address eight things every PR expert should know while offering advice on how to execute your game plan. The inbox of any reporter is constantly being flooded with daily requests, stories and the “pick me” pitches that truly believe will land them an interview on the Today Show. So instead of hoping your subject line will be seen, make it heard with strong keywords that a reporter cannot pass up opening and landing your client on top morning shows like the Today Show. Keep in mind when a reporter looks over the subject lines in their email, they literally give your phrase a one second glance, which will result in either a click or a delete. To make sure your email results with a “click” and not a delete, add creativity and a story they can’t skip past. Just as important as your subject is the actual pitch. These words are the story you want to tell of why, who and what you (or your client) is going to do for the audience. Make this pitch count, don’t waste your time (or the reporters) by filling space. Fill that email with creativity, still keeping the content short but detailed just enough in the message for a clear thought or story that all the reporter needs to do is schedule the interview and hand off your material. Every reporter has a different background and qualifications they are interested in sharing, so cater to their style and interests by creating the ultimate pitch that matches their identity. Make them want to like you because you took the time to do your homework and didn’t send a random pitch on an inappropriate or unrelated topic. Rather your pitch was creative and specific towards that reporter. For instance, if you’re pitching an author who is known for science fiction, then be sure to eliminate the romance novel reporters. However, if you believe this pitch will work for this market, then make sure you highlight the connection so the reporter doesn’t skip past this junk mail and block your emails. Everyday you need to do your homework and find out which topics are trending to correlate your pitch/story with relevant news. You can monitor these topics by adding Google alerts, which notifies you of the latest trends by using the key words you selected. Again, use these stories and topics to connect your pitch, but make sure you’re receiving daily or “by the minute” notifications to stay current and relevant. Get to know the reporter before you pitch, this could take some time as you want to follow their blog, Twitter feed and other social media sites, but it’s time well worth it for a great outcome. Regularly commenting and liking their news and stories will also gain their attention back to you, which is right where you want them. Showing you are interested in their work will only interest them in your work, so keep your social media sites current as well, constantly updating information, posts, comments, etc., to be active and available for followers. Not literally, but do walk them through the process of an interview. Prepare them for any questions and topics that could be asked at any moment to prevent the client from a disaster of looking unprofessional or fumbling with their words during the interview. You can begin to prepare for an interview by familiarizing the client with a little Q&A. Cover all topics and potential questions so their message will be delivered right, without any hesitation by the audience on what or who the interview was about and their objectives. Again, be there for them in the early stages, walking them through every step, but once their interview has taken place let them go and watch from the sidelines. Continue to take notes on areas they need to improve on, still keeping their head up high by also pointing out what they did good in their interview. Include keywords, links and SEO to help optimize any press release, shining your story a little brighter than competitors. Begin by researching keywords that competitors or the industry uses, study the search engine rankings to know which words and format will make a break through for your web page, blog and brand. In addtion to SEO, build an online newsroom, showcasing all of your work so others can see how credible you are with all material and deliveries. Keep this page current and monitored for any action that could result from reporters “liking” or commenting on your material, leading to a potential story or interview. Send out pitches on a regular basis. Whether it’s weekly or monthly, staying in contact with reporters will build your professional relationship and show the reporter your consistency and fresh new ideas/pitches you are always suggesting. Eventually the reporter will be looking for your pitch to come through and when the right one comes along, you will have built that reputation as being prepared and ready for an interview that the reporter will likely choose you over another pitch. As a PR expert, continue to go over this advice and these tips to help you and your business grow with positive influence. Also, keep in mind the advice from the Speaking of Wealth guest, Merilee Kern, President of Kern Communications, who shared three areas public relation strategies focus on: being timely, being relevant and being compelling. All of this advice is great and can be beneficial to any PR expert, but only if you take advantage and utilize these tips on every pitch.